The latest results of annual B2B payment practices survey conducted by global credit insurer Atradius show an increasing level of deterioration in payment practices in the Americas. 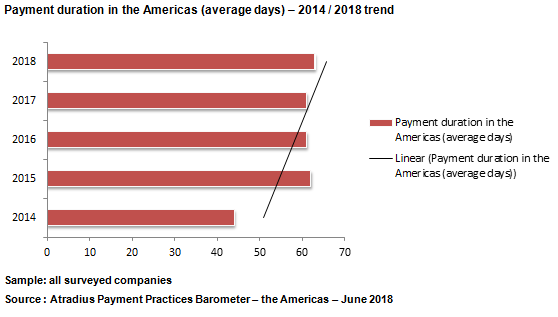 Average payment duration increased from 61 days in 2017 to 63 days in 2018. (the average is highest in Mexico (94.4%) and the U.S. (90.9%). On average 50% of invoices are unpaid by the due date. 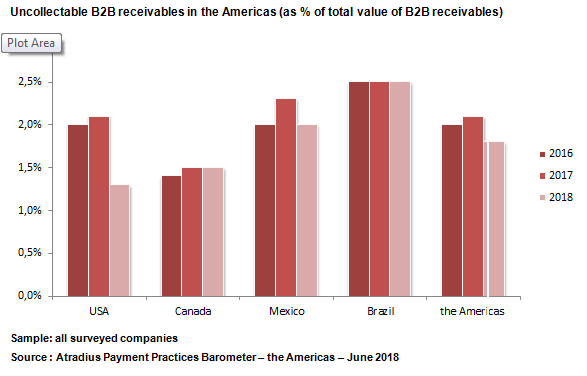 The average proportion of uncollectable B2B receivables in the Americas declined, though slightly, from 2.1% in 2017 to 1.8% this year. At 2.5%, Brazil is the country with the highest percentage of uncollectable receivables in 2018, mainly because customers filed bankrupty as reported by 54.7% of respondents in Brazil. The level of intra-regional exports seems to be stable, particularly among the NAFTA countries. This, despite the threat of a protectionist turn by the U.S. and pending the revision of the free trade agreement. Nearly half of the suppliers interviewed in NAFTA countries say that more than 50% of their commercial activities occur within the region, with 16.5% trading exclusively within the current free trade area. Trade with the U.S. either increased or remained stable for 81.5% of the suppliers interviewed in Mexico. In Canada the positive trade picture is even more pronounced with total of 90.3% maintaining the same or better trade levels with the US.